The Kollin brothers introduced their future world, and central character Justin Cord, in "The Unincorporated Man". Justin created a revolution in that book, and is now exiled from Earth to the outer planets, where he is a heroic figure. Corporate society, which is headquartered on Earth and rules Venus, Mars, and the orbital colonies, wants to destroy Justin and reclaim hegemony over the outer planets. 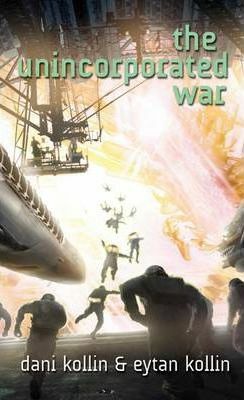 The first interplanetary war begins as the military fleet of Earth attacks. Filled with battles, betrayals, and triumphs, "The Unincorporated War" is a full-scale space opera that catapults the focus of the earlier novel into the solar system. Justin remains both a logical and passionate fighter for the principles that motivate him, and the most dangerous man alive. The first novel in this thought-provoking series. Dani Kollin lives in Los Angeles, California, and Eytan Kollin lives in Pasadena, California. They are brothers, and this is their second novel.